A man driving his motorcycle was killed while his wife who was his passenger was critically injured after their vehicle accidentally slammed into a private van in Catigbian on Wednesday afternoon. The fatality identified as Alberto Dumanayos was rushed to a hospital but was declared dead on arrival after sustaining multiple broken bones and severe bruises in the head. His wife, Norma Dumayanos, remained in critical condition. 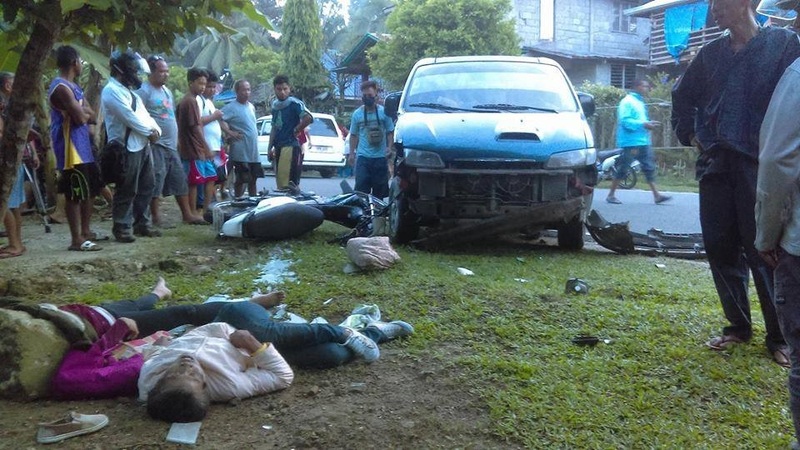 According to SPO1 Ralph Renoblas of the Catigbian police, the victims’ motorcycle suddenly hit a Starex van driven by one Renan Peteros while traversing the national road in Barangay Sinakayanan, Catigbian. Peteros said that he was about to make a turn and had turned on his signal light but Alberto who was trailing him was not able to stop in time due to high speed causing him to ram the van from behind. Both victims were rushed to a hospital while Peteros was taken into police custody.